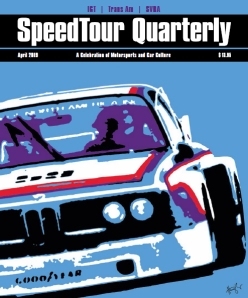 SpeedTour Quarterly represents a celebration of the International GT, Trans Am, and SVRA lifestyles. SpeedTour Quarterly offers quality photography and editorial about the cars, events and lifestyle of racing. It also delivers a unique look at the broad activities and interest of racers and automobile enthusiasts: travel, new car reviews, racing legends interviews, technology, history and racing destinations and more.